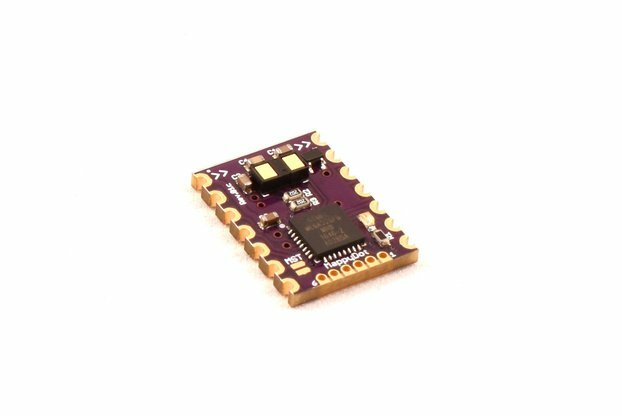 MappyDot is a smart ranging sensor which provides system designers with the ability to measure accurate distances on drones and robotic platforms for collision avoidance, area mapping, distance measurement, gesture recognition and motion sensing. 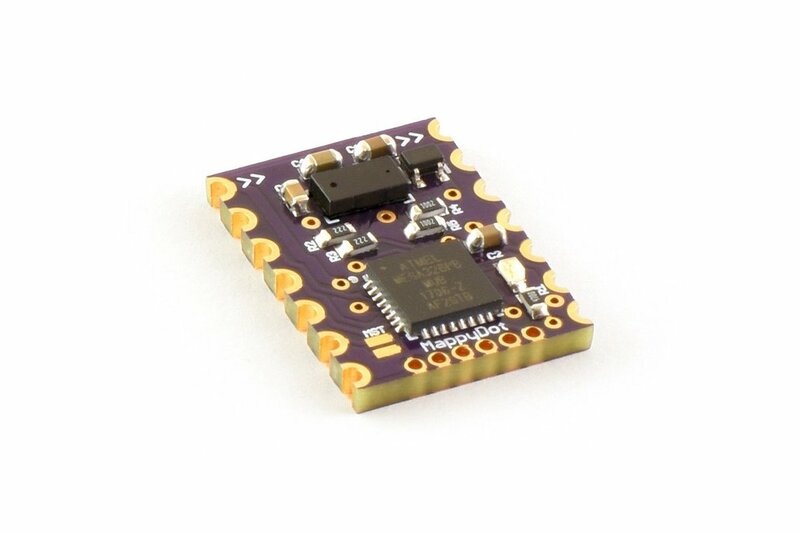 The MappyDot uses the VL53L0X laser time-of-flight ranging sensor from STMicroelectronics, which is a tried and tested 940nm Class 1 (eye-safe; IEC 6082501:2014) laser sensor, in conjunction with an on-board ATmega328PB microcontroller to provide a huge range of features. MappyDots can be used to prevent your drone from colliding with objects or optimise its landing, make star trek like door sensors to open doors automatically or even create unique musical instruments. Please Note: New firmware features are constantly being developed. For a full list of these features please visit the firmware repository. 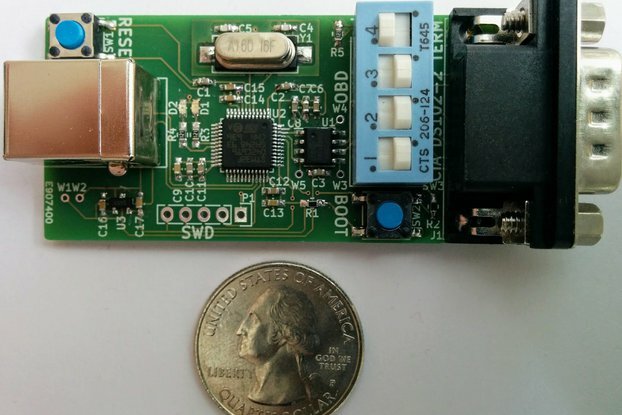 The boards will ship with the latest release firmware version available on the Github repository. Also note that the MST pin needs to be shorted to ground or the MST solder pads on the board need to be shorted, on the first device in the chain, or if you are using them standalone. For more information visit the getting started page. Be sure to remove the plastic tape cover on the sensor before use. The plastic tape isn't calibrated for and will interfere with the readings. MappyDot footprint scale compared to an Australian $1 coin ($1AUD is the same size as a US Quarter). Please note the MST pin is grounded on the first device in the chain. This is the "master" MappyDot for addressing purposes. 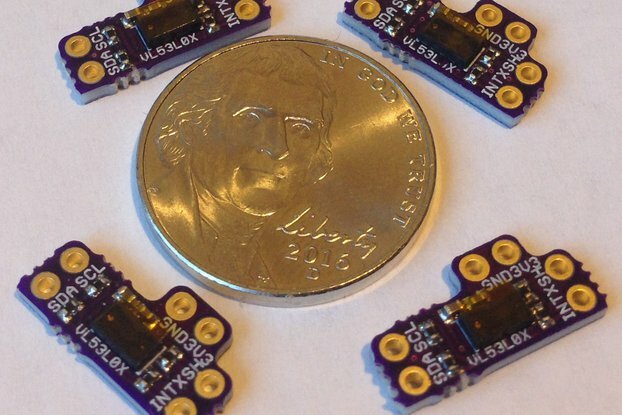 The SensorDots development board is a breakout board for use with the MappyDot. 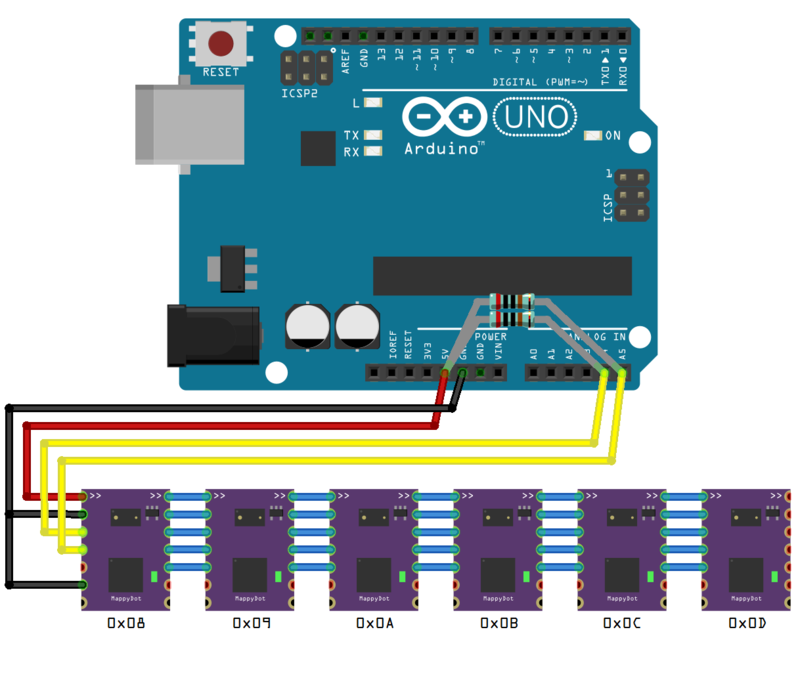 It gives you the option to either connect 2.54mm (0.1") headers to the MappyDots for easy removal, or to solder the MappyDot directly to the board. 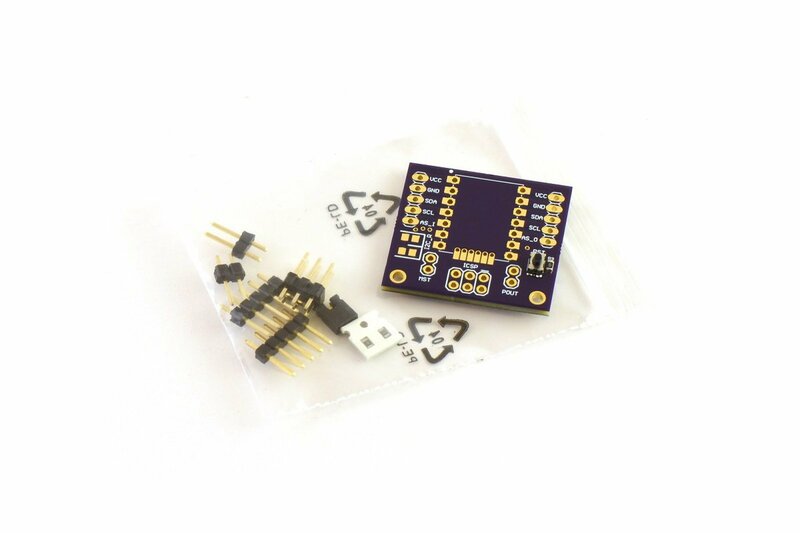 It brings out the ISP programming headers and has a reset button, master select jumper, optional I2C resistors and mounting holes for development use. The development board schematic and production files are located on the GitHub repository. 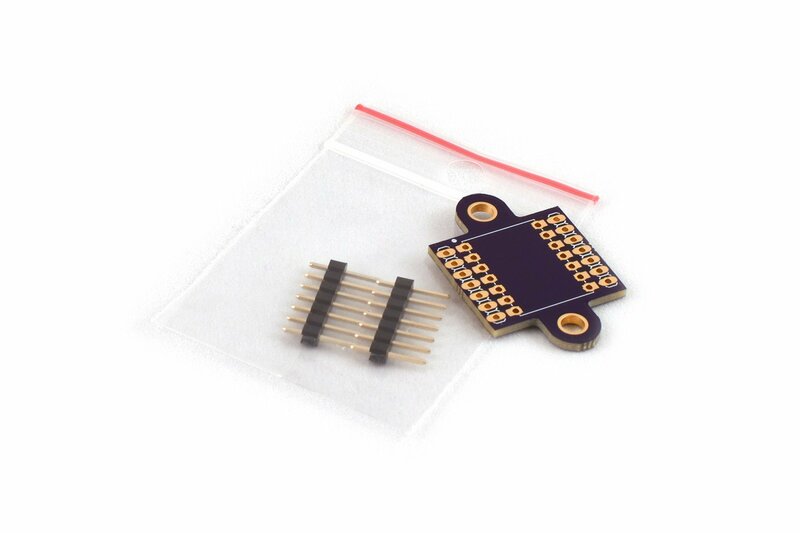 They are also available for sale as a kit with headers on the SensorDots store here. The SensorDots mounting board provides two 3.6mm mounting holes that give you the flexibility to place the boards in many arrangements for the best possible accuracy. It is available for sale on the SensorDots store here. 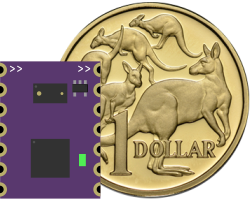 The MappyDots are assembled in Australia with our own in house reflow capability using a lead-free solder process. 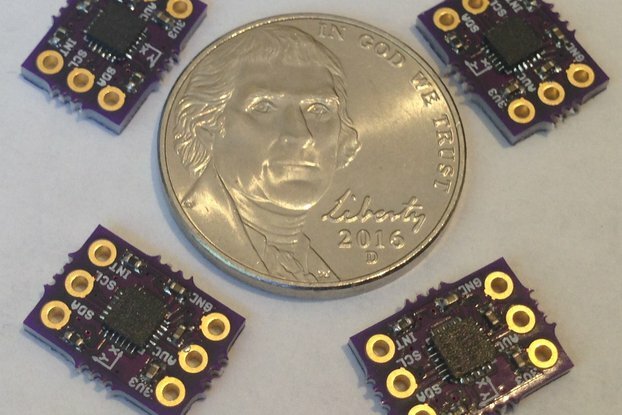 The components, boards, solder and our process meet current RoHS compliance requirements. Boards are being made based on demand, so if you miss out on current stock, there will be more on the way very soon. Add to your wishlist if you want to be notified when there's more stock. There are two options for shipping, one is tracked parcel post and the other is standard letter post without tracking (the MappyDot ships in a rigid 16mm mailer box). If you are ordering 6 or more MappyDots, the item will be upgraded with tracking in a larger box for no extra cost to the standard shipping option. If you would like something shipped urgently please contact us before ordering and we can arrange an express option. While every effort has been made to get the best tracked shipping price for most countries around the world, we may have missed a few (you will see a "Tracked Everywhere Rate" for countries not covered under a custom shipping rate). If you contact us before ordering, we might be able to work out a cheaper tracked shipping rate for your country. If you find something not right upon receipt of your order, please contact us straight away. We will do our best to help you out or work out a solution for you.